What an absolutely stunning and emotional piece of art! 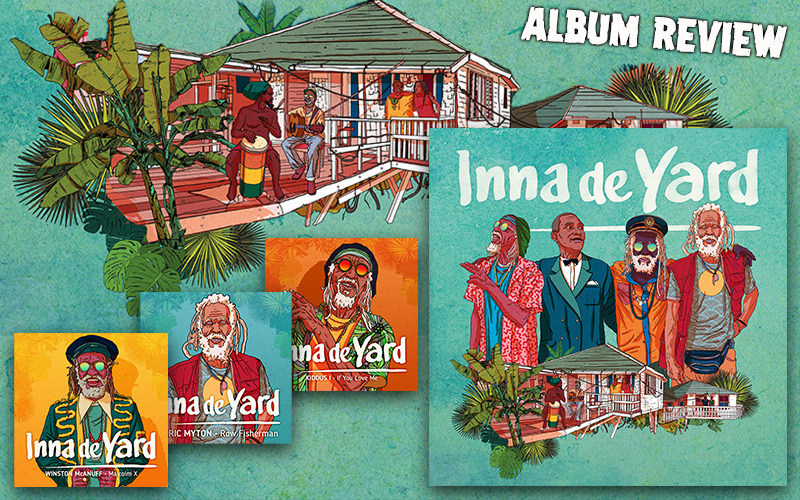 It took only one run-through to leave me deeply touched by the voices and messages put forth on the new Inna De Yard album. After the success of their 2017 release The Soul Of Jamaica, here comes chapter two of the journey (actually, it is a continuation of a foundation laid much earlier, when the French label Makasound kicked off a series of releases from within the Inna De Yard group in the early 2000s before the label disappeared in 2011, only to re-emerge as - how fittingly - Chapter Two Records recently). With the same concept and a majority of the same cast, again thirteen tracks have been carefully selected and recorded in the lush hills of Stony Hill on the outskirts of Kingston. Kiddus I opens the album and excels in the beautiful Edith Piaf cover If You Love Me, adding to that his very own Survive. The legendary Ken "Mr. Rocksteady" Boothe contributes a tender, almost fragile rendition of his 1974 cover-hit Everything I Own (originally written by David Gates from the US-band Bread for his deceased father) and the equally sentimental Speak Softly Love (first recorded by Boothe in 1974, it is a cover from the theme song of the 1972 film The Godfather). Foundation artist Cedric Myton presents with Row Fisherman one of The Congos greatest hits, and his famous falsetto is as piercing as ever. With Rebellion In Heaven, he introduces a lesser known piece from his catalogue, a battle song about the eternal fight between good and evil, God and devil. To wrap up this fine collection of veterans, Horace Andy presents Bill Withers' Ain't No Sunshine, while The Viceroys sing a fresh version of the pirate-inspired Ya Ho. One of the backbones of the Inna De Yard project, Winston McAnuff has his say as well, of course. His song, a powerful tribute to Malcolm X mostly known for its interpretation by Dennis Brown, here impresses in a version with intense percussion and a surprisingly fitting accordeon played by François-Xavier “Fixi” Bossard. As with the first release two years back, a strong focus was again laid on the face-to-face encounter of the elders and younger artists. Apart from the musical blessings this approach has brought, uniting Lamont “Monty” Savory and Winston "Bo-Pee" Bowen on guitar, Delroy “WormBass” Nevin and Ruel “Pot-a-Rice” Ashburn on acoustic bass, Nicolas Laraque, Romeo Gray, Didier Bolay and Guillaume “Stepper” Briard on horns, Franklyn “Bubbler” Waul and Robbie Lyn on the seasoned Yamaha piano as well as Alphonso Craig, Rashaun “Kush” McAnuff, Kevin Campbell, Dino Pinnock, Nadia McAnuff and Kerry Dyke on percussions, it accommodates some fascinating features as well. Thus, Judy Mowatt invites Jah9 for an x-amount of female power on her fierce Black Woman, while Kevor "Var" Williams and Derajah join Winston McAnuff in a haunting livication to the latter's son Matthew McAnuff, who enjoyed massive success with his hit Be Careful before he was murdered in 2012. Stricken by such a senseless killing was Derajah, too, who lost his sister to a gang-related shooting in Kingston. His Tribute To My Sista brought instant tears to my eyes, as all the pain still burning in him can immediately be felt. With such a relevant background, Var's final, balladesque Live Good carries a weighty potency that will resonate within you for a long time. The overwhelming effect of Inna De Yard (next to its sheer artistic quality, of course! ), lies, once more, in the simple intimacy of its creation: the dog barking during the last notes of Malcolm X, the crickets and Ken Boothe's exclamation after Everything I Own, the murmuring voices at the beginning of Black Woman or the buzzing fly and the crowing rooster after Speak Softly Love - these are recordings of a music that breathes and lives, of a vibe that is not trapped inside the soundproof sterility of studio walls or digital casings. Laurent Jaïs and Fabien Girard have indeed done a wonderful job recording these gems, as did Nicolas “Kouakou” Mamet and Olivier Bonhomme with the accompanying cover artwork. But the album, as wonderful as it is, doesn't tell the full story. Director Peter Webber has accompanied the artists involved over the course of several weeks and created a vivid documentary about their lives (both in Jamaica and on tour) and the evolutionary history of the album. With a sad relevance, both the documentary and the album might be the last recorded testimonies of guitarist Winston "Bo-Pee" Bowen who passed away in March this year. "Inna De Yard is an amalgamation of a number of the elders who are the roots of the Reggae business." say Kiddus I in the documentary. "The message that we put out is a message of healing, uplifting and caring." Speaking of caring: supporting this incredible project by purchasing the album, watching the movie or visiting one of the live shows scheduled for this summer is a must for every fan of Reggae music!